Every girl dreams about that magical night called Prom. 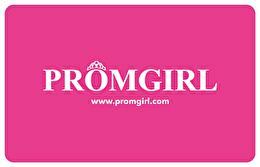 Give the "Gift of Prom" and help make that special occasion more affordable with a gift card to PromGirl.com. Available in denominations between $25 and $500, they make a great gift for birthdays, stocking stuffers, rewards for good grades, as a "thank you", or just for being an amazing kid! A PromGirl Gift Card is the perfect solution… It's always in style and it fits every time. Visit our Gift Card Center at PromGirl.com, Amazon.com and QuickGifts.com and make someone's dream Prom come true! Where can I purchase the Gift Card? What amounts are available for purchase? A customer service representative is available to speak with you by phone Monday through Friday 8:00 a.m. to 6:00 p.m. EST. To speak to someone, please call 1-888-843-7766. Gift cards will be automatically activated within 48 hours of purchase. PromGirl gift cards remain active up to 5 years after date of purchase. Can I add money to my card? PromGirl gift cards are not reloadable. What happens if I lose my gift card or the card is stolen or damaged? The value of this card will not be replaced if the card is lost, stolen, damaged or used without your permission. Can I return a gift card that has not been used? Gift cards are final sale and cannot be returned or exchanged. If you wish to return items bought with a gift card, you will receive an additional code for the valued amount after a return. For balance inquiries call the phone number to a PromGirl.com's location below.